« Follow Me on Instagram and Facebook! 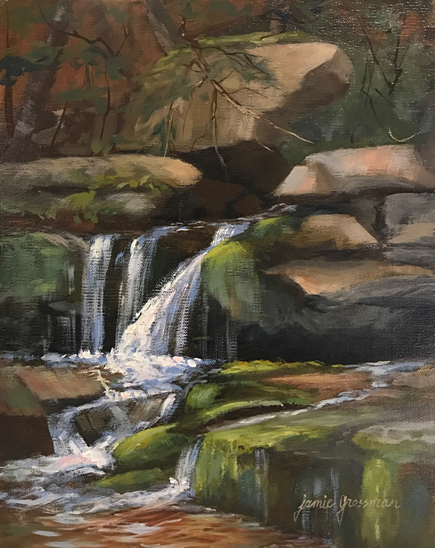 I spent two days painting this little waterfall on location, and then a bit of time tweaking it in the studio. Finally I’m happy with it! It’s all varnished and ready for a new home. Don’t forget that my show opening is this Sunday, September 30, from 3-5pm at the Hendrick Hudson Library, 185 Kings Ferry Road, Montrose NY. Hope to see you there! If you can’t make it, the show runs until October 28. This painting and many more recent works, including some not yet on my website, will be on display. Posted by Jamie on Monday, September 24th, 2018 at 4:03 pm.